The Colorado Jazz scene has always been active, but never really definitive. Denver and Boulder have few actual jazz venues (thank god for Dazzle Jazz) and most of the renowned artists that tour through choose mid-sized theatres, performing arts centers, or even laid back dives as their outlet. Since our music culture is so welcoming and lets face it, who wouldn’t want to tour through our beautiful state, we get some of the hottest names in Jazz touring through and giving their all to Rocky Mountain audiences. Living local means you have the endless selection of acts touring through to choose from, and for many, picking-and-choosing becomes a constant process since there’s so much going on. 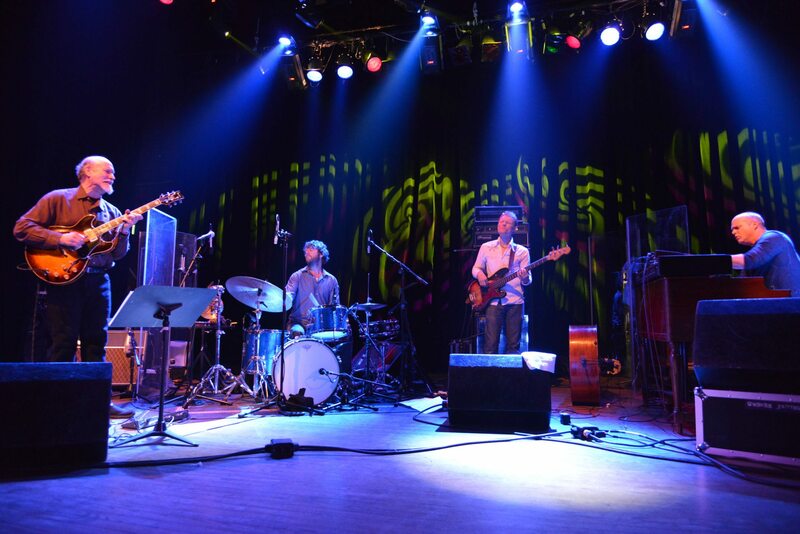 When the Bouder Theatre announced in July that John Medeski, John Scofield, Billy Martin and Chris Wood were going on tour as a quartet and stopping through our neck of the woods, there was no question that it was going to be one of the hottest shows of the years. 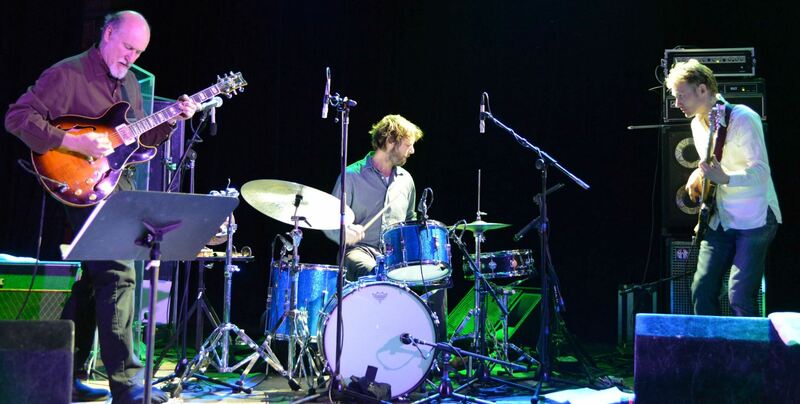 Though jazz trio Medeski, Martin & Wood (or MMW) could be too eclectic and spacey for less adventurous listeners, when joined with the forces of legendary guitarist John Scofield, the quartet takes on a forwardly energetic and musically complex acid-jazz feel. Scofield has played with the best of them, is a Miles Davis alumnus, and has defined so much about progressive jazz as a solo musician for decades. He has released two albums with MMW, both incredible, and the seeing this quartet perform is an extreme rarity. The quartets collaborative efforts date back to 1998 with John Scofield’s album A Go Go, which featured MMW as his backing band. With 2006’s Out Louder, the four finally released a long awaited release credited to the full band. Their sound draws from so many different corners of instrumental and popular music. Organist/Keyboardist John Medeski’s in-your-face B-3 solos turn from experimental to funk in one bar. Billy Martin’s Latin-laced rhumba shuffle is combined with various fusion elements like no other drummer out there. Bassist Chris Wood combines classical upright bass with experimental bow techniques and plays electric with fiery fluidity and uncompromised dexterity. The MSMW project has always had a cult status, since they tour rarely but still continue to collaborate. One could imagine the thrill of fans when the short tour was announced. The Boulder performance sold out weeks in advance with little publicity. Last year Scofield graced Denver/Boulder crowds with his presence in Phil Lesh & Friends three-day run at 1st Bank Center. He really can play with anybody who’s musically gifted, but when the quartet was announced I knew I had to go. The Saturday night Boulder Theatre crowd was buzzing from positive reception from their Ogden Theater, Denver date the night before. I kept hearing word of insane covers and extensive jamming that never got too spacey. When house lights dimmed and the quartet walked onstage, they didn’t waste a moment with crowd rousing or introductions. Immediately they begin to play; a refreshing change from the normal jam-band MO of the bands taking their sweet time to tune everything up onstage. The show opens with two intense improvisations. Laying the foundation for a long-strange-trip of a night. The quartet tastefully showcases their talents, not in a traditional “I Solo, You Solo” way, but as musical comrades in a soundscape journey together. After taking their time to get into a solid groove, the band segues into one of my favorites off of the Out Louder album, “Little Walter Rides Again” into “Tequila and Chocolate”. Though this material is over five years old, nothing came off as stale or familiar. Scofield’s nuanced soloing never overpowers but lifts his three band mates to new musical possibilities. These four threw the idea of song-after-song out the window from the get-go and made the first set one seamless funky groove with different intersections and musical themes. I was shocked when the band took a break and nearly an hour and a half had gone by. Lost in the moment. After a short set break, the second set was highlighted by various cover songs. All this talk of “what covers are they gonna play tonight?” were met with unmatched enthusiasm. Covers included Bob Marley’s “Lively Up Yourself”, a moving rendition of “Amazing Grace”, and an unexpected encore of Ray Charles’ “I Got A Woman”. And what do these three tunes all have in common? That the band wanted to cover them. Nothing else. Naturally everything was instrumental but played with such conviction that vocals became unnecessary. Another second set highlight was the MSMW original “Miles Behind” (no doubt a nod to Scofield’s former bandleader). The tune is complex fusion at its best with Billy Martin’s off-kilter timing challenging Scofield’s fast-paced shred techniques. Every time I see MMW perform I am reminded of how risky their approach to music is. Though there is pre-composed music for most of their tunes, everything seems created for the moment, and most-often the chances they take are executed with the utmost clarity and control. I was thrilled to finally have the chance of seeing MMW perform with John Scofield. Throughout the performance the band mates were nodding props to one and other. Appreciating their time onstage together with real sincerity. Outside of this short tour the only place you can see this quartet any time soon is on Jam Cruise. Hopefully you caught them coming through and if you didn’t there’s always their next time (who knows when that will be?) Those who did make it out will likely cherish the performance for years to come. This isn’t some ordinary project and the guys take on so many different solo projects that its fair to say getting the four on the road all at once proves challenging. Thanks to the guys in band for making Colorado a double-stop on their tiny tour. We love everything about your music and can’t wait for some fresh material (some day). In the meanwhile you can support MMW and Scofield by listening to In Case The World Changes It’s Mind, the relatively new MSMW live release that I admittedly have not heard yet. For all you lucky ducks going on Jam Cruise, enjoy the jams and bring back some good stories please.